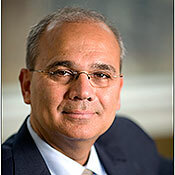 Jamshed Bharucha was the twelfth President of The Cooper Union for the Advancement of Science and Art. Prior to this position, which commenced on July 1, 2011 and concluded on June 30, 2015, he served in academic leadership positions at Dartmouth College and Tufts University. A cognitive neuroscientist, he has published extensively on the cognitive and neural underpinnings of music (using a variety of methods including perceptual experiments, computational neural net models and MRI brain scanning), has been awarded grants from NSF and NIH for his work, and has served as Editor of the interdisciplinary journal Music Perception. More recently, he has written and lectured widely on the challenges facing higher education, emphasizing the need for bold innovations in learning and global engagement. Speeches and announcements made during his four year tenure can be found here.